Help protect your floors from daily wear-and-tear while getting the look of a professional floor finish. The versatile urethane fortified sealer/finish is great for use on high-visibility, nonresilient flooring. The formula applies easily and eventually dries to an excellent, durable glossÑgreat for public floors. Versatile, urethane-fortified sealer/finish for use on high-visibility, nonresilient flooring. Applies easily with finish mop and dries to a durable gloss. Burnishable. 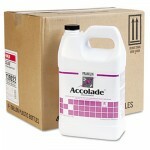 Provides protection of a quality sealer and gloss of a floor finish. Will not yellow. Contains 20% solids. Meets ASTM D-2047-82 standard for slip resistance.